Recent studies have implicated the microRNA biogenesis enzyme Dicer as a suppressor of breast carcinoma metastasis and elucidated upstream signaling pathways that control Dicer levels. The overwhelming majority of human cancer deaths are attributable to distant metastases, rather than the primary tumors from which these malignant lesions originate. Metastases arise through the completion of a series of complex, interrelated cell biological events - collectively termed the 'invasion-metastasis cascade' - involving the dissemination of tumor cells to anatomically distant loci and the subsequent adaptation of these tumor cells to the foreign microenvironments encountered there . Molecular mediators of these events have recently begun to be identified; however, our understanding of the pathogenesis of metastatic disease remains woefully incomplete. One class of molecules that have been documented to have a crucial role in regulating the invasion-metastasis cascade are microRNAs (miRNAs). miRNAs are an evolutionarily conserved family of small regulatory RNAs that pleiotropically suppress gene expression through sequence-specific interactions with the 3' untranslated regions (UTRs) of cognate mRNA targets . Research conducted over the past 3 years has succeeded in elucidating various individual miRNAs that serve either to enhance or to impair discrete steps of the metastatic process . Two recent studies [4, 5] have now evaluated the consequences for metastasis of a global reduction in the levels of all the miRNAs produced by a cancer cell. More specifically, these investigators have discovered signal transduction pathways that lead to downregulation of the miRNA biogenesis enzyme Dicer and have then assessed the repercussions of impaired Dicer function for breast carcinoma metastasis (Figure 1). Dicer is an RNase III family endonuclease that is required for the post-transcriptional processing of miRNAs to their mature, functionally active form . Previous studies have shown that global miRNA levels are often reduced in human tumor specimens ; moreover, experimental inhibition of Dicer or other components of the miRNA biogenesis machinery has been reported to accelerate primary tumor development . However, the recent studies from the laboratories of Piccolo  and Flores  are the first to address the functional contributions of Dicer specifically to metastatic progression. A diagram of the known components of metastasis-controlling signal transduction cascades that involve Dicer. While the suppressive effects of miR-31, miR-126, miR-206, and miR-335 on metastasis have been directly documented in vivo [8, 9], the roles of miR-130 and miR-200 in metastasis are implied by in vitro studies [3, 7], but have yet to be analyzed directly in vivo. Piccolo and coworkers  report that the miR-103/107 family of miRNAs directly targets the mRNA encoding Dicer. Thus, these miRNAs reduce expression of the very enzyme that is responsible for their own biosynthesis. miR-103/107 and Dicer levels were found to be inversely correlated in several cancer cell lines and in tissue specimens derived directly from human breast cancer patients. Surprisingly, although miR-103/107 expression was positively associated with the propensity to suffer from metastatic relapse in human breast tumors, no significant correlation between Dicer levels and the risk of developing metastatic disease was found. This finding implies that miR-103/107 can pleiotropically regulate other, still-unidentified mRNA molecules that encode functions relevant to metastasis. Moreover, the authors  did not investigate the possibility of dynamic changes in Dicer and miR-103/107 levels arising from the feedback loop between them. The authors  also discovered that overexpression of miR-103/107 enhanced the motility of breast carcinoma cells in vitro. These effects on cell motility could be potently reversed via forced expression of Dicer, implying that the ability of miR-103/107 to enhance cell motility was closely tied to its capacity to reduce Dicer levels. Further corroborating this finding was their observation that short hairpin RNA (shRNA)-mediated suppression of endogenous Dicer levels increased in vitro motility in these same breast carcinoma cells. Additionally, inhibition of miR-103/107 or overexpression of Dicer sufficed to impair the in vitro motility of otherwise-aggressive breast cancer cell lines. It is intriguing that Dicer overexpression sufficed to enhance cell motility, as this suggests that Dicer catalytic activity can be rate-limiting for miRNA biogenesis - at least in the context of certain tumor cell lines. 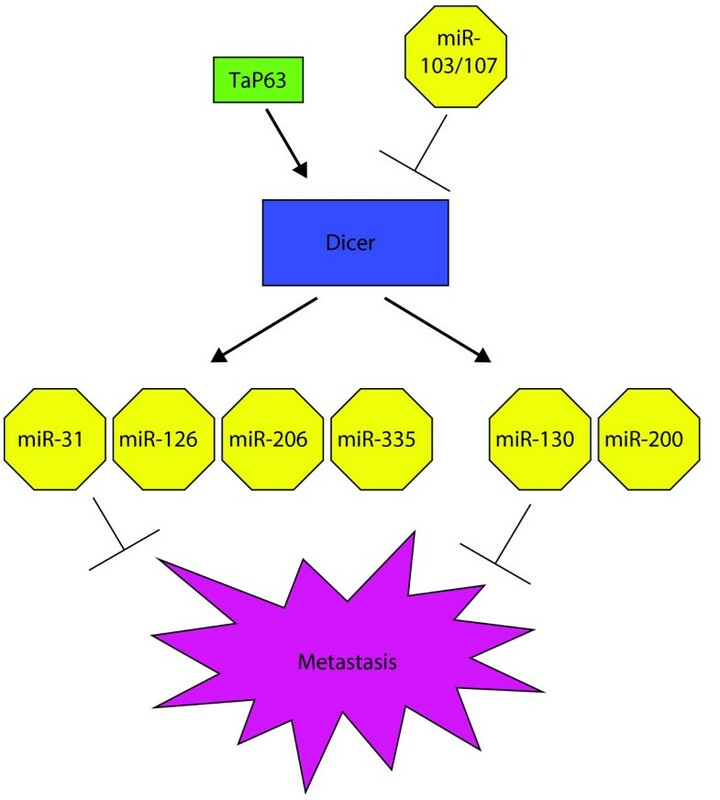 miR-103/107 and Dicer also influenced the in vivo behaviors of breast carcinoma cells grown as tumor xenografts. More specifically, miR-107 overexpression endowed otherwise weakly metastatic breast cancer cells with heightened metastatic powers; these influences of miR-107 on metastasis were essentially abrogated by the concurrent forced expression of Dicer. shRNA-conferred suppression of the Dicer-encoding mRNA also increased metastasis formation in these xenograft studies . In addition, the authors observed that either inhibition of miR-103/107 or overexpression of Dicer reduced the metastatic potential of otherwise-metastatic mammary carcinoma cell lines in vivo. These results show that Dicer expression is both necessary and sufficient to impair a variety of malignant attributes in vitro and in vivo, and that modulation of Dicer levels can explain a significant proportion of the effects of miR-103/107 on these same traits. Finally, Piccolo and colleagues  showed that miR-107 overexpression or shRNA-mediated suppression of Dicer triggered an epithelial-mesenchymal transition (EMT) in normal mammary epithelial cells. Because the EMT has previously been linked to the promotion of motile behavior in carcinoma cells , they reasoned that loss of Dicer expression might enhance cell motility through the induction of an EMT, presumably by disrupting miRNA-controlled fate decisions. Indeed, they found that modulating miR-103/107 levels altered the activity of miR-200 - a crucial EMT-inhibitory miRNA  - in their cell culture models. However, the authors  did not address the relevance of these miR-200-dependent signaling events for in vivo metastatic abilities, nor did they determine the contributions of other known anti-metastatic miRNAs - such as miR-31, miR-126, miR-206 and miR-335 [8, 9] - for mediating the observed anti-malignant responses. Together, the work of Piccolo and colleagues  shows that Dicer can be post-transcriptionally suppressed by miR-103/107, leading to enhanced metastatic capacity following the dampening activity of the metastasis-suppressing Dicer enzyme. Dicer expression levels are controlled by several different signaling pathways. The recent findings of Flores and coworkers  - which highlight one mechanism by which transcription of the Dicer gene is controlled - are therefore highly significant. In this study, the authors  noted that mice engineered to be genetically deficient for the p53-related transcription factor TaP63 developed metastatic tumors with an increased frequency. In fact, whereas TaP63 +/- and TaP63-/- mice contracted metastatic carcinomas with an equivalent prevalence, the TaP63+/- animals were at an even higher risk for developing metastatic sarcomas than were the TaP63-/- mice; the mechanistic rationale underlying this observation remains imprecisely defined and merits further investigation . The Flores laboratory  hypothesized - because of similarities of the haploinsufficiency of TaP63 for tumor suppression, and also of the embryonic lethality of TaP63-/- mice on an enriched C57Bl/6 background before embryonic day 8.5, with the previously reported corresponding phenotypes of Dicer conditional knockout animals  - that TaP63 and Dicer might operate within the same biochemical pathway. Indeed, they discovered that levels of the Dicer-encoding mRNA were dramatically reduced in cell lines derived from TaP63-deficient animals; furthermore, low expression of TaP63 was correlated with low Dicer levels in patient-derived metastatic human tumor specimens. In addition, the authors  showed using chromatin immunoprecipitation (ChIP) analyses that TaP63 can bind directly to the promoter region of Dicer. Therefore, TaP63 can directly regulate expression levels of Dicer. In functional assays, the authors  discovered that forced expression of Dicer reversed the increased invasiveness elicited by TaP63 deficiency in vitro. Increased invasion was also triggered by the shRNA-conferred suppression of endogenous Dicer levels in the same in vitro assays. However, the effects of modulating Dicer levels on the in vivo metastatic behaviors of carcinoma cells were not investigated in this study ; this is a crucial topic for future investigation, as rigorous analysis of metastatic attributes requires detailed in vivo analyses. The authors  also undertook to identify additional transcriptional targets of TaP63 that might also be important for mediating its influences on the aggressive behaviors of carcinoma cells. One such downstream effector of TaP63 was found to be the miRNA miR-130b. Direct binding of TaP63 to the putative miR-130b promoter sequence was documented by ChIP experiments. Also, in functional assays, inhibition of miR-130b resulted in increased motility in vitro - a phenotype reminiscent of the cell-biological changes elicited by modulation of the expression levels of either TaP63 or Dicer itself. The augmented in vitro invasiveness observed in cell lines derived from TaP63-deficient mice could be completely reversed by the concomitant overexpression of miR-130b and Dicer. The data of Flores and colleagues  therefore imply that TaP63 can alter certain cellular behaviors - such as invasiveness - that are believed to be important for the acquisition of a metastatic phenotype via the coordinate transcriptional regulation of Dicer and miR-130b. The work of the Piccolo  and Flores  laboratories reveal that Dicer functions as a potent suppressor of metastatic attributes in breast carcinoma cells. Given the diverse roles of various individual miRNAs during the invasion-metastasis cascade - including both metastasis-promoting effects and metastasis-suppressive influences  - it is striking that a global reduction of miRNA activity results in such a clear and unambiguous phenotype in multiple different breast carcinoma cell lines. An important direction for future research will involve determining whether Dicer has a similar metastasis-suppressive role in carcinomas derived from tissue types other than the breast. From a practical standpoint, however, it seems highly likely that the critical functions orchestrated by miRNAs in a wide spectrum of different tissue and cell types will preclude the development of anti-Dicer-based therapeutic agents designed to block metastatic disease. We thank Julie Valastyan for critical review of the manuscript. Research in the authors' laboratories is supported by the NIH, MIT Ludwig Center for Molecular Oncology, US Department of Defense and Breast Cancer Research Foundation. SV is a US Department of Defense Breast Cancer Research Program Predoctoral Fellow. RAW is an American Cancer Society Research Professor and a Daniel K Ludwig Foundation Cancer Research Professor.